The Golden Spoons: Godspeed, Sweet Dreams. 6:00 am. My alarm goes off and I drag myself out of bed. Throw on some yoga pants and put my hair in a ponytail. Then, I trudge down the hall. Lights on. Coffee on. Alarm off. Dog out. 6:30 am. Time to make the rounds. I go to them one by one and the whirlwind begins. We start the routine that should be automatic. In the sleepy fog of mornings, though, it is not. Wake up. Get dressed. Eat breakfast. Finish packing the lunches. Brush your teeth. Comb your hair. Collect your things. Shoes on. Jacket on. Out the door. I deliver them to their schools - two in this direction; one in that direction. I am back home. In the silence. Hours pass much too quickly. They are at school learning, playing, socializing, learning, learning. I am doing all the things I need to do. Dishes, laundry, sweeping, straightening, blogging, running errands. Maybe walk. Hopefully shower. I blink once. I blink twice. It's time to go bring them back home. I savor the last few moments of calm as I sit in the carpool line. They jump in the minivan chatting, giggling, arguing, occasionally crying. "How was your day?" Tell me more. I want details. We are home briefly. Then back out to get the third. "How was your day?" I want to know everything. Back home again and the whirlwind resumes. Snack time. TV time. Homework time. They whine. They argue. They laugh. I am the conductor, directing everyone. "Do your homework." "Be nice to your sister." "Practice your piano." "Finish your homework." "Clean up your mess." "Stop." "Go." In a flash, we are out the door again. Riding lessons, soccer practice, piano lessons, gymnastics class. The whirlwind furiously swirls. Somewhere in there, I throw supper on the table. We sit together and talk. But, hurry. Finally, bath time. Pajama time. Bedtime. One by one, I make sure they brush their teeth and read their books. I turn on their night lights. I hug them. I kiss them. I say "Good night, sleep tight." Their day is done, but mine is not. There are still lunches to prepare, emails to answer, papers to sign. I try to catch up. Spend time with my husband. I promise myself I will go to bed early this time. I don't. Eventually, I give in to the fatigue. My day ends just like it began - only in reverse. Dog in. Alarm on. Lights off. Tiptoeing into each room, I make my rounds one last time. I adjust their covers. I turn off the night lights. I kiss each of their foreheads. I watch them breathe. I inhale. Exhale. My heart and soul fill with wonder as I watch their slumber and this songs plays in my mind. "Godspeed sweet girl. Sweet dreams precious child. My love will fly to you each night on angels' wings. 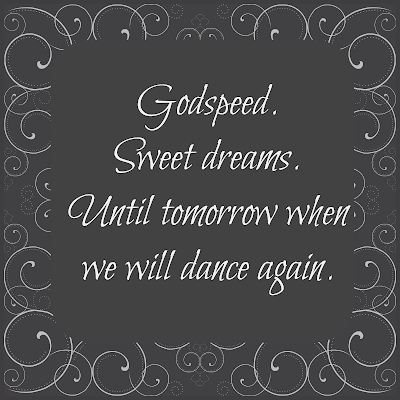 Godspeed, sweet dreams." They are still. They are quiet. They rest serenely. They look like angels. This moment is the best part of my day. There is comfort in watching them sleep. There is peace in hearing them breathe. We are safe. We are together. We are loved - by each other; by God. The whirlwind of the day melts away and that moment is all that matters. Godspeed. Sweet dreams. 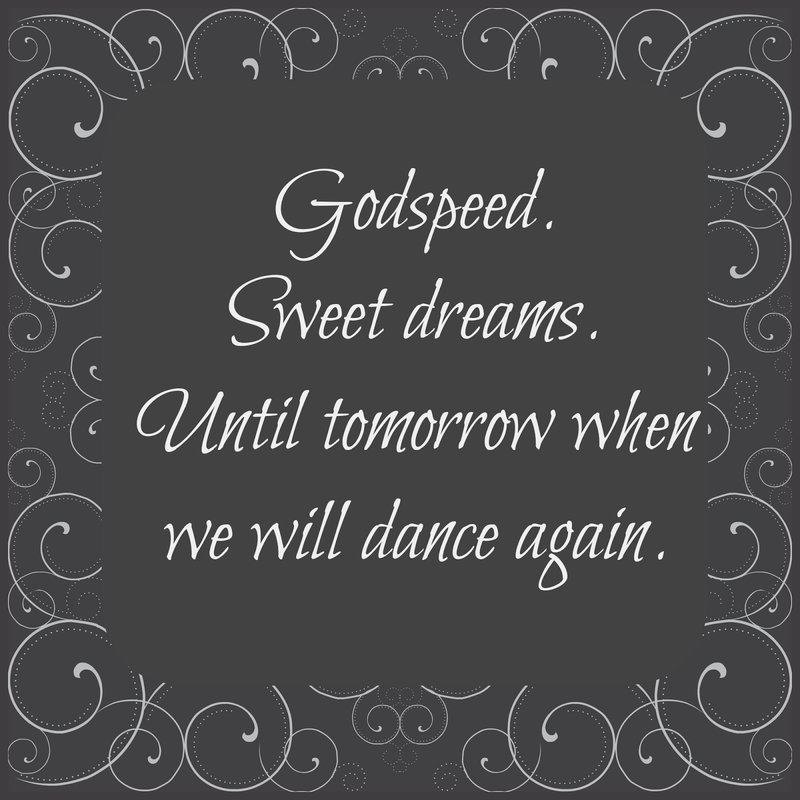 Until tomorrow, precious girls, when we will dance again. This post was written as part of Finish The Sentence Friday and the prompt was "The best part of my day is..." FTSF is hosted by some wonderful blogging ladies. Please give them a visit and check out all the other blogs that participate as well! 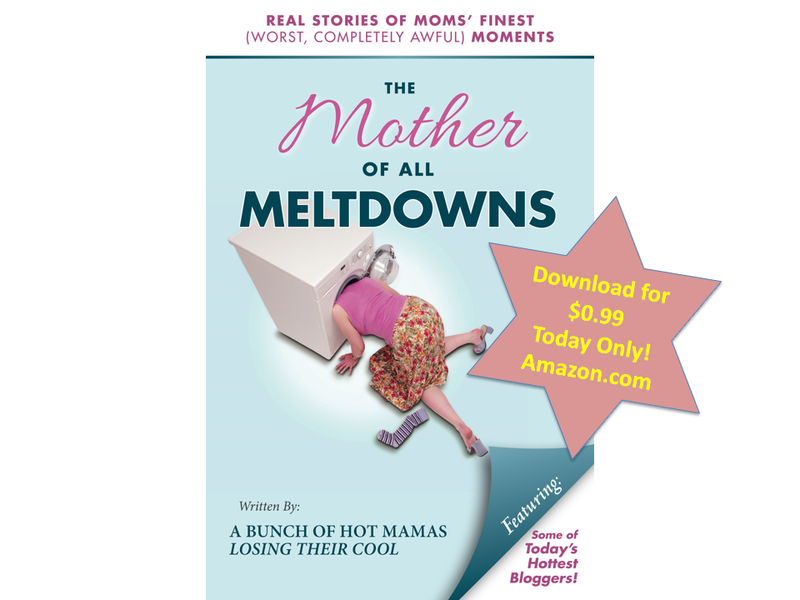 Today is a great day to get your copy of The Mother Of All Meltdowns because it's on sale!!! You can download it for only $.99 right now!!!! 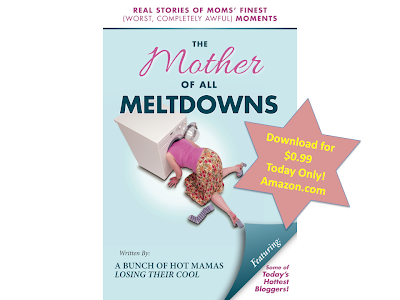 Or click HERE to share your meltdown story and have a chance to win a paperback copy! Yup, was definitely shedding a few tears at the end of this and do know that feeling all too well of kissing them one more time even though they are asleep. As crazy as the day is, I too am just glad they are safe and sound in their beds at night. So I think you said this perfectly and thank you as always for sharing and linking up, too!! Oh Lisa! SO totally tear-inducing. The ending gave me goosebumps, tears, and wonder. Isn't it amazing how the day can shift so quickly from the chaos to the beauty? And by the way? I promise myself (every night) that I'll go to bed early, too. It never happens. This is a super lovely post. Love. At the end of the day, even if I'm looking at two tired hours to myself, it's all miraculous. Wow I loved reading that, not only beautifully written but I felt soothed by your words! I am so glad I got to spend time with you- however brief it was! you are just as beautiful in person, as in your blog! Awwww! Seeing them asleep at the end of the day is really the best part of the day. It's just so secure isn't it? After I've told him stop talking and go to sleep, I'll come in a steal a kiss from him cheek and smile and his heavy breathing. This is so tender and beautifully written. I don't miss the days of rushing around when my children were small and active, but I sure do miss tucking them in at night and kissing their sweet little faces. I now have a grandchild, so hopefully I will get this opportunity once again! It is - peaceful and secure and perhaps the only time they are still enough to steal a kiss! I suppose every stage has positives and negatives. I could certainly do with a little less chaos, but I know someday I will miss these nighttime moments. I love watching my kids sleep, especially my now 17yo daughter. When she sleeps, there is nothing that even hints at that fact that she is disabled. She's just a kid, like everybody else's. How precious is that? Your day sounds much like mine. We are blessed, aren't we? You painted the glorious picture perfectly, my friend!! Aww, this is beautiful. I love watching my kids in their most peaceful state - sleep. You did a really good job of showing how busy moms are too.